While Edan’s take on an outsider’s experience in Japan has its own slant, it plays well in a small but vibrant stand-up scene that gives foreign residents a chance to share stories and laughs about life here, often alongside curious locals. Stand-Up Tokyo — which Hager describes as “a collective of comedians” — supports regular nights across the city and helps bring over well-known international comics. “There are different showrunners but they all fall under the same umbrella,” says Hager, who was born in Egypt and raised in the Netherlands. Los Angeles-based Edan, who has played at legendary U.S. venues the Comedy Store, Laugh Factory and Gotham as well as in Berlin and Amsterdam, says performing in Tokyo and Osaka was “on-par” with the States and Europe. “The audiences were some of the best I’ve had, and I was surprised to see that there were both expats and native Japanese speakers laughing along,” she says. Edan headlined on April 4 at Stand-Up Tokyo’s flagship event held every Wednesday at Good Heavens, a British-themed pub in Tokyo’s Shimokitazawa neighborhood. She warmed up by performing at an open mic night called Get on the Mic! that Stand-Up Tokyo started staging last year, due to demand from comics, every Monday at Titans craft beer bar in Otsuka. 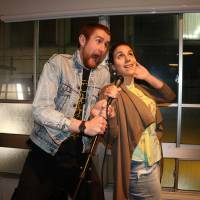 Accommodating up to 16 comedians, who can book a slot up to 15 minutes before it starts, the night is a testing ground where established performers such as Edan can try out new material and budding comics can make their first steps. One such rookie is Fergal Daly, who was performing for just the second time on April 16. First up was local comic Ryo Wakabayashi, who was dressed in a traditional Japanese hakama robe and opened his routine by saying, deadpan, “I always wanted to be a samurai,” but abandoned the idea as he could not stand the idea of sticking a knife in his belly. Another homegrown participant pointed out the close similarity in the pronunciation, and sometime the reality, of the Japanese words for husband and prisoner. Evans Musoka from Kenya told the audience he always wanted to be African-American because they are cool, “not like white Americans.” He joked that he could never pass himself off as African-American in the U.S. or U.K., but in Japan he has more success. 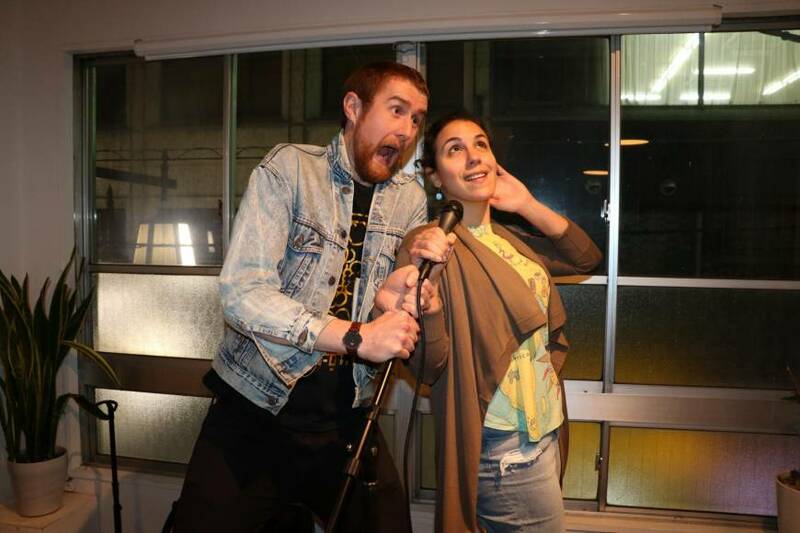 While the open mic night can be an opportunity for foreign comedians to vent their frustrations at life in Japan, Hager says they strive to keep the vibe positive. “We don’t want to encourage people to slag off the country, but at the same time the motto is ‘as long as it’s funny.’ It has to be funny,” she says. Stand-Up Tokyo also puts on a monthly show called Okomedyaki that features non-Japanese comedians doing the usual Western-style observational, confessional stand-up, but in Japanese. “The audience really like that style of comedy but can’t find it by Japanese performers in Japanese,” Hager says. But most of what happens under the collective’s umbrella is about bringing together a disparate group of foreign residents who share a passion for laughing, often at the expense of their own cultures.